Fender has just unveiled the first in a new generation of acoustic guitars. Called the American Acoustasonic Series Telecaster, this electro-acoustic guitar is described by Fender as being acoustic, electric and everything in between. It's basically a whole bunch of guitars in one. 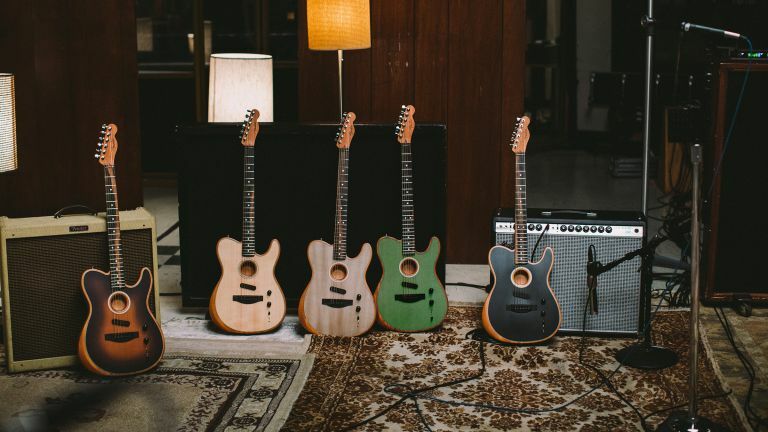 To avoid multiple instrument changes during a song, the Acoustasonic Telecaster makes it easy to switch between different electric and acoustic tones. This is great news for people in guitar shops, who can now delight us with the entirety of Led Zeppelin's Stairway to Heaven – both the winsome, acoustic intro and the thunderous electric solo – without needing to switch axe half way through. Billy Martinez, Fender VP Category Manager, Acoustic and Squier Divisions says that this is "an entirely new instrument that blurs the lines between acoustic and electric guitars, giving artists multiple acoustic body shape and wood tones, as well as great electric tones, at their fingertips. The result is an amazing acoustic guitar that melds the best of both the analogue and digital worlds." The guitar is essentially a semi-acoustic guitar with electric Fender Acoustasonic Noiseless magnetic pickups and digital processing that optimise the guitar’s natural sound. This also allows the strings to trigger a curated collection of 'voices', both acoustic and electric. These can be played solo or blended via the excellently named 'Mod Knob' to create new sounds. Several voices can also be played simultaneously, layering acoustic, semi-acoustic and electric sounds.